You’ve been religiously applying for jobs on all the major job sites. You’re even checking the weekly paper for job listings. But with so many people looking for work, it sometimes feels like even with all you’re doing, it’s still not enough. Well, while scanning job boards, and even checking the paper, are definitely things you should be doing in your job search, there are also more non-traditional ways to make headway in the job market, ways that are often overlooked. Here are just five unique ways to help you land that all important interview. 1. Research companies and contact them explaining how your specific skills and experience can help them in the current climate. If you’ve done your research well, you’ll learn the company’s mission, their current focus, and you might get a feel for where they’re headed in the future. In a well crafted letter, explain how your unique combination of skills can help them meet their goals. By doing this you may find that you’re able to “create” a position that hadn’t previously existed, or apply for a position before it’s officially been advertised. 2. Strike up conversations. Waiting at the airport, train station, or even your doctor’s office? Strike up a conversation with your neighbor and bring the conversation around to work. You’d be surprised to learn how many people are willing to help another find work. Ask if their company is hiring, and ask for specific names and contact information if the person is open to giving it. 3. If you’re in an artistic or creative field, create a resume that’s sure to stand out from the crowd. Maybe it’s in the form of an e-postcard, a website, or even a hand-designed, one of a kind resume. These types of presentations showcase your creativity and your ability to think outside the box. 4. Consider promoting yourself as a freelancer/contract employee. By offering your services as a freelancer, you’re able to test-drive a company while they get a feel for your abilities. Freelancers tend to bring in a higher hourly rate, although they often are not covered under a company’s health insurance plan. 5. You can always try this method for finding employment. 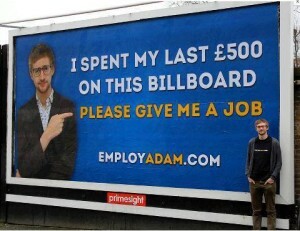 After sending out over 250 CVs, unemployed 24 year old college graduate Adam Pacitti spent his last £500 to take out the billboard pictured above. Here’s hoping some employer appreciates his creativity! To read Adam’s full story, click here.